It’s been a bit pricy this year, usually 4 for $2. I mean, that’s not crazy expensive, but I wanted to make some chowder, and get a bit in bulk, so I kept my eye out for price deals. Last weekend I found it. 3 for $1. Perfect! So I came home with 9 ears. I didn’t know how much I’d use in the chowder, but more is better, right? Then I got another 5 ears from my CSA on Tuesday. Oops. I guess there is such a thing as too much of a good thing. But don’t worry, none of those ears went to waste! I figured 6 ears for the chowder and went ahead and froze the other 8 ears, giving me two well packed quart sized ziplocks full of corn for the summer. And the chowder? 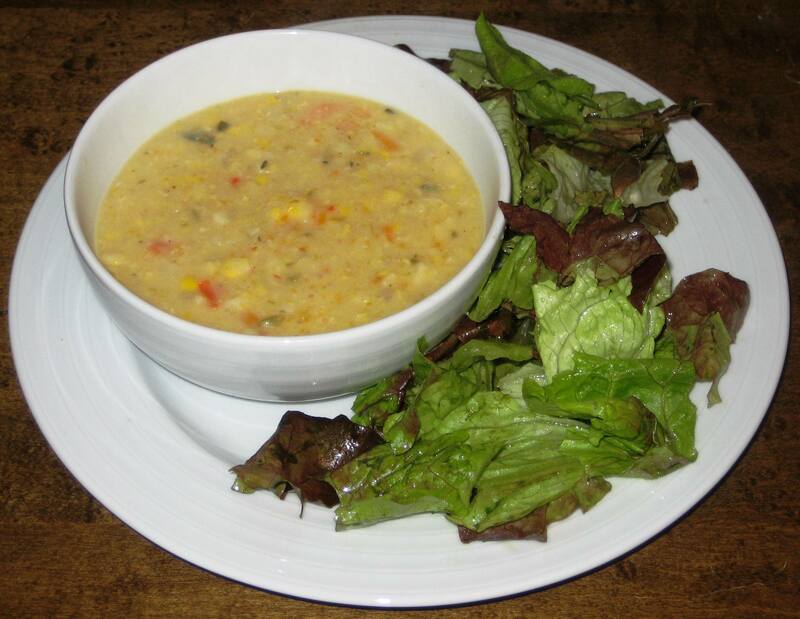 My husband deems it the best corn chowder he’s ever had. In a large dutch oven, melt butter. Add onions and cook until translucent. Add carrots, celery, peppers, and poblano pepper and cook until veggies slightly soft (10 minutes). In the meantime, cut corn kernels off cob. Save the cobs! I add them to the chowder as it cooks for more corny flavor. Add potatoes, broth, salt and corn cobs to pot (cut corn cobs in half and fit as may as you can in the pot; I only fit 4 cobs). Bring mixture to a boil then reduce heat, cover and simmer for about 30 minutes until potatoes are very soft and flavors start to blend. In a separate bowl whisk flour and water until flour is dissolved. Add corn kernels and flour mixture to the pot. Bring to a boil again and simmer for about 10 minutes until corn is tender. Remove corn cobs. The flour mixture should have thickened the chowder a bit, but at this point I like to puree a bit with an emulsion blender to thicken it up. If you prefer chunky, skip this step. Season with additional salt and pepper to taste. Garnish with scallion (forgot this part…) and serve. Goes great with a simple tossed salad or a warm piece of cornbread, if you have it. We ate our fill and saved some for leftovers, then froze the rest for another day. This looks delicious! Definitely going to make some!